Julián receives an unexpected visit of his friend Tomás, who is a professor and lives in Canada. Julián is an theater actor and has been fighting Cancer for a year and his only companion now is Truman, a loyal dog. The two friends, along with Truman, shares four days together. Julián reveals he is opting for assisted suicide if things gets worst rather than Chemotherapy. His cousin Paula and Tomás are equally disturbed by the news and they share emotional and meaning making moments during the stay-over. They try to cope with Julián's complicated situation. 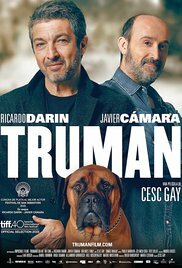 Julián sends his dog with his friend and they bid goodbye after an intense closure. Read more on Wikipedia.